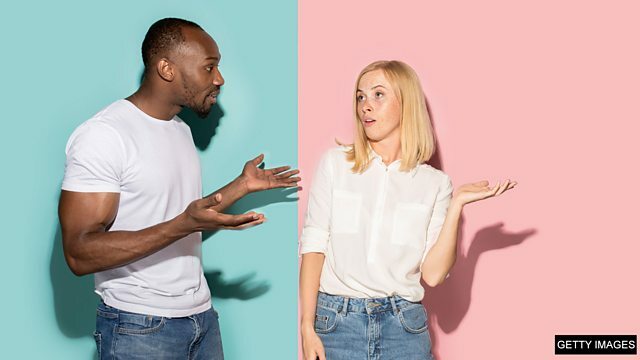 Listen to learn some useful phrases we can use to disagree with someone. How do I disagree with someone? A: English is the easiest language to learn! B: I'm not so sure. A: English grammar is easier than learning vocabulary. B: I see what you're saying, but I think the opposite. A: Taking English classes is the best way to improve. B: I agree to a point. A: Listening is the easiest skill to improve. B: I'm afraid I disagree. A: Learning tenses in English is really easy. B: Yes, but don't you think that there are too many rules? The second person said 'I'm not so sure'. 'See', in this example, means 'understand'. After 'but', you can add your own opinion. Let's listen to the third speaker – how do they pronounce 'to a'? They said 'to a'. Let's practise this – repeat after me. I agree to a point. 'I'm afraid' is a polite way to say 'I'm sorry'. The consonant sound links with the vowel sounds – listen and repeat after me. ผู้พูดบอกว่า 'yes' เพื่อสื่อว่าเข้าใจ จากนั้นก็ใช้คำว่า 'but' เพื่อพูดถึงความเห็นของตัวเอง These phrases are easy to learn, don't you think, James? Yes, but I think we should try to practise them before the end of the programme! พูดเหมือนกันไหมคะ เก่งมากค่ะ แล้ววลีที่บอกว่าไม่เห็นด้วยโดยมีคำว่า 'afraid' ล่ะคะ? I see what you're saying, but unfortunately it's time to go now! See you next time everyone! 1) I’m not so sure. A) The best drink in the world is coffee! B) I’m not so sure. A) The best drink in the world is Coca-Cola! B) I see what you’re saying, but I think it’s too sweet. 3) I agree to a point. A) Orange juice is the most refreshing drink. B) I agree to a point – it is refreshing, but I don’t think it’s the most refreshing. 4) I’m afraid I disagree. B) I’m afraid I disagree! A) Coffee is too bitter! B) Yes, but don’t you think it smells great? A) Hip hop is better than jazz. B) I’m ______ I disagree. Which of these phrases DOESN’T mean you partly agree? I ______ what you’re saying, but I’m not so sure. Would you like more episodes of How do I...? They’re a useful way to learn English – how could you disagree?! Come to our Facebook group for more discussion.